Introduction. We have read with interest the article by Rustam Abrarovich Sadykov et al. (2019) on “New hemostatic preparation made of the cellulose derivatives”. The Authors present their early experience on new samples of pellicle hemostatic coverage on the basis of the cellulose derivatives. They conclude: “Rapid enough biodegradation of polymer along with the unexpressed inflammatory reaction allows preventing the infecting related to the presence of foreign body. The rapid forming of fibrotic tissue in a zone of lesion makes it possible to obtain a durable hemostasis”. Results. In our series we noted a 10% rate of allergic skin reactions with irritation, redness, itching, swelling, rash and hives in the mammary region, successfully managed with steroids and antihistamine medications. In addition, we experienced a significant seroma in the site of oxidized regenerated cellulose (ORC) placement in 45% of our patients. Conclusion and Recommendation. 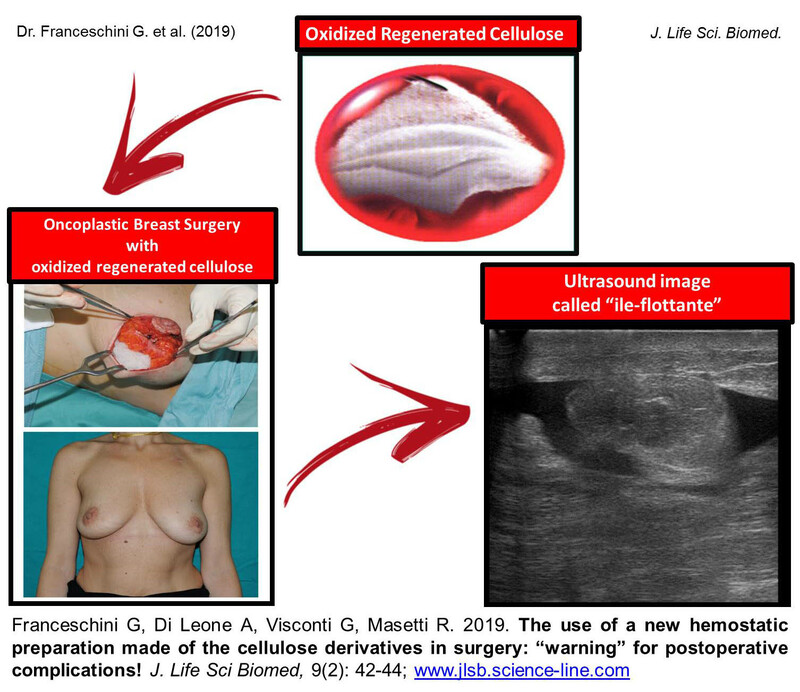 When using a new preparation made of the cellulose derivatives, as a possible aid to reduce the risk of postoperative haematoma and infections it is important to discuss with the patient also about possible postoperative complications. It is also important that surgeons specify clearly the use of this biomaterial in the report of the surgical procedure so that radiologists can properly interpret the sonographic findings due to this biomaterial and avoid misdiagnosis and undue alarmism during the follow-up of these patients. Introduction. In surgery, the prevention of postoperative complications has always been and remains relevant. One of the most important components that contribute to reducing the number of complications, in addition to effective drainage, restoration of muscle tone and adequate breathing, is reliable aerostasis and hemostasis. When performing operations on the lungs against the background of the presence in patients of factors affecting the incidence of failure in aero- and hemostasis (COPD, emphysema), the risk of developing these complications can reach 11.8% after lobectomy, after wedge-shaped resections up to 9.1% and after decortication up to 33.3%, which is 14.7% for all operations in general (violation of aerostasis - 5.9% and hemostasis - 8.8%. Aim. The aim of study was to investigate the effectiveness of the proposed domestic implant “Geprocel” in the treatment and prevention of disorders of aero- and hemostasis during pulmonary operations. Methods. The study included 69 patients operated in the department of surgery of the Lung and Mediastinum of the "Republican Specialized Scientific and Practical Medical Center of Surgery named after Academician V. Vakhidov" State Institution for the period from 2015 to June 2018. Hemostatic implant in the form of a fine powder was developed at RSRCS named after acad. V. Vakhidov”. Geprotsel consists of the following components: the sodium salt of carboxymethyl cellulose, oxidized cellulose and nanocellulose associated with calcium ions (Patent No. IAP 20160273), in accordance with requirements of ISO 10993-1-2011. Results. 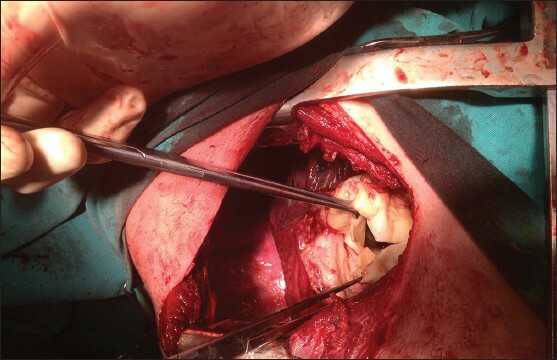 The use of the Heprotsel biological implant reduced the need for additional single lung tissue flashing to ensure adequate aero- and hemostasis from 38.2% to 11.4% and multiple reinforcement with sutures from 29.4% to 5.7% (χ2 = 7.706; Df = 2; P = 0.021). Introduction. Stem cells have the extraordinary potential to develop into many diverse cell types in the body during early life and growth. Significant progress has been made in understanding the biochemical and metabolic mechanisms and feedback associated with different stem cells response. Some of the challenges concerning transplanted embryonic stem cells and mesenchymal stem cells are immune-mediated rejection, senescence-induced genetic instability or loss of function, and limited cell survival. Aim. 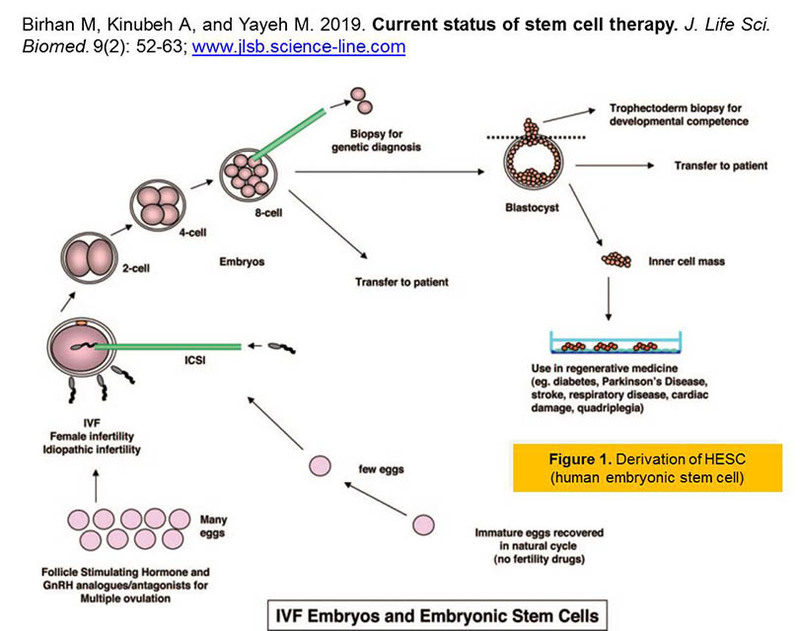 The aim of this review, is to recapitulate the recent status and information about the use of embryonic stem cells and mesenchymal stem cells for research into how cells and tissues of the body grow and develop, and potentially useful for curing disease. Results. Stem cell therapy efforts are currently underway for virtually every type of tissue and organ within the human body. Because the current status of stem cell incorporates the fields of cell transplantation, materials science, and engineering, personnel who have mastered the techniques of cell harvest, culture, expansion, transplantation, and polymer design are essential for the successful application of this technology. Various stem cell therapies are at different stages of development, with some already being used clinically, a few in preclinical trials, and some in the discovery stage.